St Patrick’s is an integral part of Melbourne, and its history tells us much about Melbourne’s birth and growth. Situated on the fringe of the city grid, close enough to the heart of Melbourne it is a powerful presence for all Catholics. In 1974 Pope Paul VI conferred the title and dignity of minor basilica on it. On 1 April 1851, The Colonial Secretary of Victoria granted five acres land to the Roman Catholic Church for the construction of a church. The Augustinian friar James Goold , first bishop of Melbourne decided to build cathedral on the Eastern Hill site. 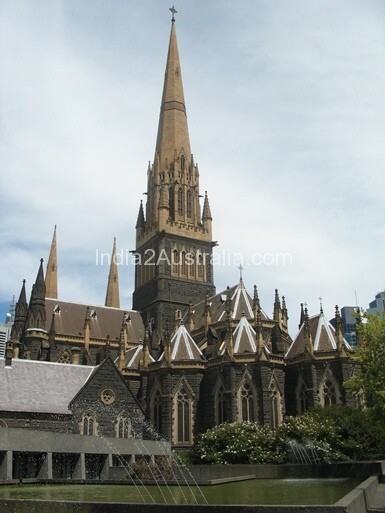 Since the Catholic community of Melbourne at that time almost entirely Irish, the Cathedral was dedicated to St Patrick, the patron saint of Ireland. The project was delayed due to severe labour shortages during the gold rush of 1851. The foundation stone was laid on 1858. The cathedral was designed in the Gothic style of early Fourteenth Century, based on the great medieval cathedrals of England. The nave was completed within ten years, but the construction was delayed further by the depression of 1891. The Cathedral was consecrated on 1897 when it was still unfinished. The spires and other elements were added in the late 1930’s and the building was officially completed in 1939.